This is the second in a three part series of reports on the Southeast Asia-Western Europe market. 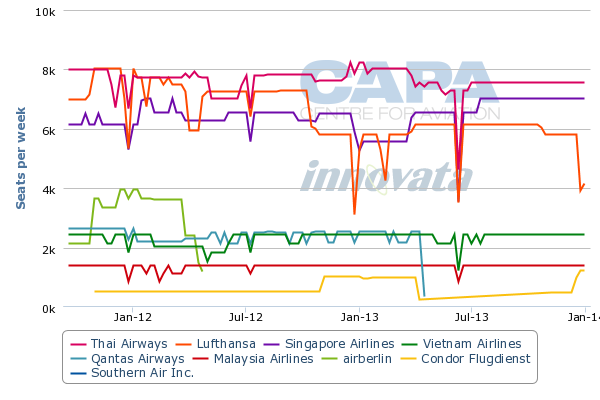 The first part analysed the position of Southeast Asian carriers as Philippine Airlines (PAL) and Garuda Indonesia prepare to join four peers in operating non-stop flights to Europe. This part looks at the position of European carriers, where there also has been a new entry along with expansion by some of the existing carriers. Norwegian became the eighth European carrier and first LCC to serve the Southeast Asian market in Jun-2013, when it launched services to Bangkok from Oslo and Stockholm. Norwegian brings a return of low-cost services to the Asia-Europe market following the withdrawal of AirAsia X, which dropped its A340-operated London and Paris routes in Mar-2011. AirAsia X is now focusing on routes within the Asia-Pacific region and flights of less than nine hours, using A330-300s. Norwegian has big ambitions for Southeast Asia and is preparing to open a base at Bangkok which could support additional flights to Europe. But for now Norwegian's main focus is on more rapid expansion in the North Atlantic, where flights are shorter and potentially more conducive to the long-haul low-cost model. Norwegian’s flights to Bangkok operate with a flying time of about 11 hours, making it, along with Jetstar’s Australia-Hawaii services, one of the longest LCC routes in the world. Norwegian is temporarily operating the flights with wet-leased A340-300s, which is also the type AirAsia X used on its highly unprofitable Kuala Lumpur to London and Paris routes. As AirAsia X discovered, it is nearly impossible to make money on long-haul low-cost flights with four-engine aircraft at current fuel prices. Fuel accounts for such a large portion of total costs on such flights that it makes it difficult for LCCs to achieve a sufficient enough unit cost advantage over full-service carriers to profitably undercut competitors. And if they are unable to compensate by achieving higher yields through networking, they are necessarily at a disadvantage. But Norwegian plans soon to transition its new long-haul flights to the more efficient 787. The carrier initially intended to launch its long-haul operation with 291-seat 787s but was forced temporarily to use A340s due to another round of 787 delivery delays following the global grounding of the 787 fleet in Jan-2013. Norwegian finally took delivery of the first of eight 787-8s on 28-Jun-2013 and is temporarily operating the aircraft on routes within Europe ahead of using the new type to replace the wet-leased A340s on services to Bangkok and New York. Norwegian launched services to New York from Oslo and Stockholm at the end of May-2013, from Oslo to Bangkok at the beginning of Jun-2013 and from Stockholm to Bangkok on 20-Jun-2013. The carrier plans to transition all four routes from the A340 to 787 by early Sep-2013. Norwegian told analysts during its 11-Jul-2013 2Q2013 results presentation that the first 787 will be placed on long-haul services on 15-Aug-2013 and a second 787 will begin operating long-haul routes on 1-Sep-2013. Norwegian said it currently plans to take delivery of three 787s by the end of 2013, another four 787s in 2014 and its eighth aircraft in 2015. As CAPA reported on 12-Jul-2013, Norwegian has stated that its new long-haul operations are performing ahead of expectations, with an average load factor of 96%. This was assisted by the launch coinciding with the start of the peak season for European leisure travel. The carrier will need to achieve high load factors year-round to meet its goal of having a cash-positive long-haul operation in 2013. Norwegian is confident the operation will be able to generate profits as it gains scale in 2014, when it projects to carry almost 1.1 million long-haul passengers. Asia’s long-haul LCCs will be closely watching Norwegian to see if the carrier can be successful at using the 787 to open profitable long-haul routes to Southeast Asia. If Norwegian proves the model can work and quickly expands in the region, AirAsia X will likely be encouraged – or compelled – to re-enter the European market using its future fleet of A350s. AirAsia X is in the process of establishing an affiliate in Thailand (where short-haul AirAsia already has a cross border JV, Thai AirAsia), which plans to launch services within the Asia-Pacific region in late 2013 or early 2014. Over the long term Thai AirAsia X could consequently end up competing against Norwegian in the Thailand-Europe market. Thai Airways also has been looking at launching a long-haul low-cost subsidiary and could be persuaded to make a move if Thai AirAsia X and Norwegian emerge as a new competitive threat. Jetstar and Scoot also have 787s on order and could look at using the type to launch services to Europe from their Singapore bases. For now Jetstar, Scoot, AirAsia X and Asia’s most recent long-haul low-cost operator, Cebu Pacific, are focused on flights within Asia-Pacific and to the Middle East. Also, with Lufthansa apparently considering establishing a long-haul low-cost operation to Southeast Asia, either in its own right, or more likely with a partner, there are several tantalising options beginning to take shape. If Lufthansa does set up a long-haul low-cost entity, or partner with other interests to operate in partnership, other European majors would face pressure to ensure they had adequate competitive responses. Norwegian has big ambitions for Asia, particularly the Thailand market. It sees growing demand for leisure travel between Asia and Europe. Norwegian is in the process of establishing a base in Bangkok, which will lead to lower costs and give it a competitive advantage over other European carriers. The carrier recently began recruiting crew for the planned Bangkok base. Norwegian, however, is planning to expand its North Atlantic operation over the next several months as it takes delivery of additional 787s. Capacity to New York is being added with the introduction of a fourth weekly flight from Oslo. Service to Fort Lauderdale is being launched at the end of Nov-2013 with two weekly flights from both Oslo and Stockholm. Flights between Scandinavia and New York are about eight hours while flights to Florida are about 10 hours. Norwegian will likely closely monitor the performance in its initial three long-haul destinations – Bangkok, New York and Fort Lauderdale – before determining deployment plans for the four 787s being added in 2014. If the economics of shorter long-haul flights work out to be more favourable on the 787, as Asia’s long-haul low-cost carriers have discovered is the case with current generation aircraft, Norwegian could end up focusing expansion in 2014 on the North Atlantic. Several factors will determine if new-generation aircraft will end up sufficiently changing the operating economics of routes over 10 hours to make ultra long-haul flights viable for LCCs; fuel costs are one, but a range of more intangibles, including networking opportunities and yield potential are equally important. Norwegian’s fares from Bangkok are low, starting at just over EUR200 one-way including taxes during off peak periods. But six weekly flights are not sufficient to significantly alter the complexion of the marketplace, given Norwegian’s small share of the market and the fact economy fares in the Thailand-Western Europe market are often cheap. Bangkok is a huge inbound leisure market but yields to and from Europe can be very low. Norwegian is able to offer a wide variety of connections for Bangkok passengers as it has nearly 100 destinations from its Oslo hub and over 50 destinations from Stockholm. But it has only a 1% share of non-stop capacity in the Southeast Asia-Western Europe market. 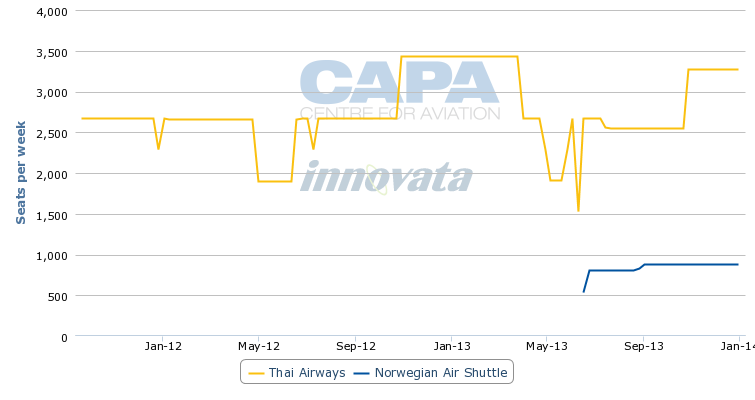 Even between Thailand and Scandinavia, Norwegian’s capacity share is only about 15%. Thai Airways is competing against Norwegian on the Bangkok to Oslo and Stockholm routes but has a significantly larger amount of capacity in both markets than the entrant. Thai traditionally has had competitive fares in the Europe-Southeast Asia market across both economy and business although Thai has not yet matched Norwegian’s promotional fares in either cabin. (Norwegian has configured the premium cabin on its 787s with 32 recliner seats in 2x3x2 configuration and 46in pitch. Norwegian's one-way premium fares from Bangkok to Oslo or Stockholm start at about EUR600 including taxes). Thai is likely hoping that Norwegian has too small a presence in the Bangkok-Scandinavia market to impact its yields or loads. Thai has the benefit of offering an extensive network beyond Bangkok, both to other destinations in Thailand as well as throughout Asia. As Norwegian inevitably attracts some of Thai's passengers from Scandinavia to Bangkok, Thai could focus more on offering connections to other destinations in Asia. Thai is currently the only carrier from East Asia serving Oslo. In Stockholm, Thai and Air China are the only East Asian carriers. Thai Airways currently has about 2,200 weekly one-way seats to Oslo and will offer about 2,700 weekly seats at the end of Oct-2013, according to CAPA and Innovata data. Norwegian in comparison will have only 873 weekly seats in the Bangkok-Oslo market once it transitions to the 787, giving it only a 25% share of capacity in the market compared to 75% for Thai in the upcoming winter season. On the Bangkok-Stockholm route, Thai Airways currently has just under 2,500 weekly seats, which is slated to increase to about 3,330 for the winter season. 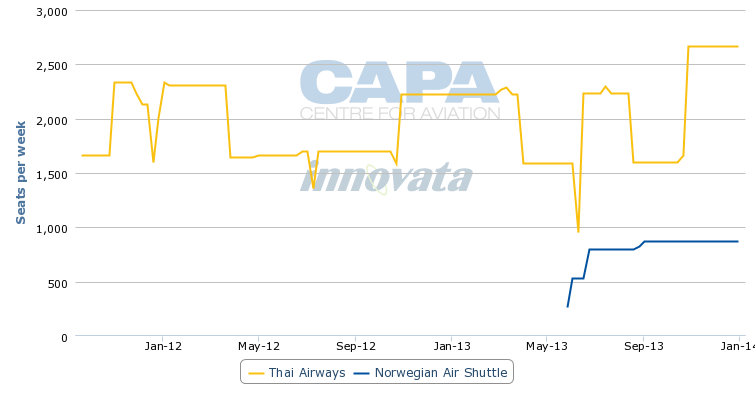 Norwegian’s 873 seats will account for only about 21% capacity in the Bangkok-Stockholm market this winter. Thai also operates daily services to Copenhagen. Fellow Star member SAS has also traditionally served the Bangkok-Copenhagen market but dropped Bangkok, its only destination in Southeast Asia, in Apr-2013. 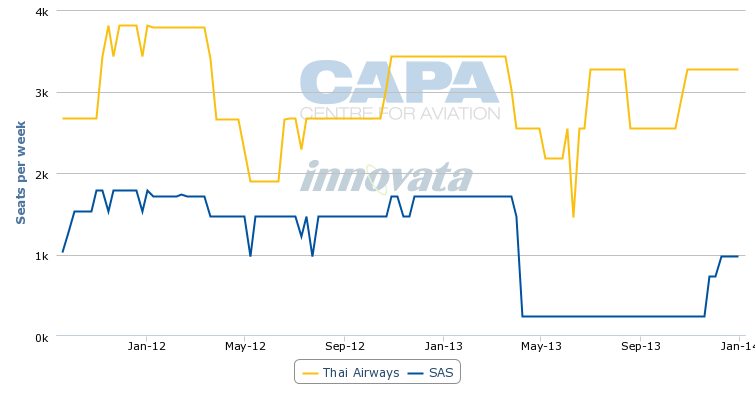 SAS is planning to resume Bangkok-Copenhagen service in late Nov-2013 but with only three flights per week. While Norwegian is not serving Bangkok-Copenhagen it will be interesting to see if SAS, which has a much higher cost structure than Norwegian and Thai, elects to stay on the route even on a seasonal basis over the long term. For the total Thailand-Scandinavia market, Norwegian will account for 15% of the almost 12,000 one-way seats per week in Dec-2013. SAS will account for 8% and Thai a commanding 77%. Thailand-Scandinavia is a relatively small market but has potential for growth when taking into account connecting traffic on both ends. Oslo and Stockholm are well positioned geographically for connections to Europe while Bangkok is well positioned for connections to other destinations in Southeast Asia. The overall Southeast Asia-Europe market consists of over 250,000 weekly non-stop seats. SkyTeam's KLM is currently the largest European carrier in Southeast Asia based on capacity and number of destinations. The Dutch carrier also has traditionally offered very competitive fares in the Southeast Asia-Europe market, but Norwegian has now taken over the role as the lowest fare provider – although KLM has five times the capacity and a much larger Southeast Asian network. KLM currently serves six destinations in Southeast Asia – Bali, Bangkok, Kuala Lumpur, Jakarta, Manila and Singapore. Only Bangkok, Kuala Lumpur and Singapore are served non-stop as Jakarta is tagged with Kuala Lumpur, Bali with Singapore and Manila with Taipei in Taiwan. KLM competes with Taiwan’s China Airlines to Bangkok, with Malaysia Airlines (MAS) to Kuala Lumpur and with Singapore Airlines (SIA) to Singapore. KLM’s non-stop capacity to Southeast Asia has been relatively flat over the last year, with about 7,400 one-way weekly seats provided in Jul-2012 and Jul-2013. Sister carrier and SkyTeam leader Air France, however, has increased capacity by 29% to Southeast Asia over the last year from about 5,000 one-way seats in Jul-2012 to about 6,400 seats currently. The increase was driven by the launch of three weekly flights to Kuala Lumpur in Apr-2013. Kuala Lumpur has joined Bangkok, Ho Chi Minh City and Singapore in Air France’s Southeast Asian network. 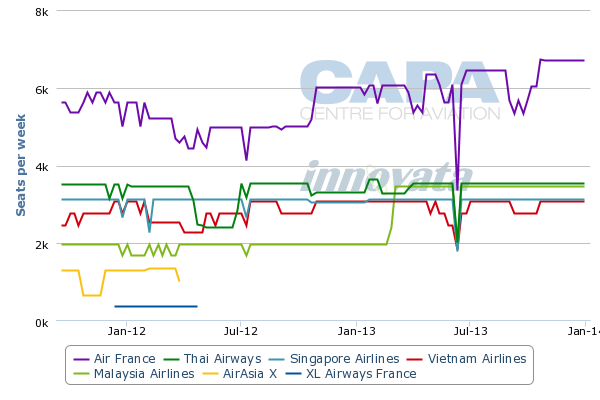 Air France competes with Thai Airways, SkyTeam partner Vietnam Airlines and SIA on its three Southeast Asian routes. Unlike KLM, Air France currently serves all its Southeast Asian destinations with non-stop flights. Air France however served Phnom Penh in Cambodia as a tag with Ho Chi Minh until Phnom Penh was dropped from its network in Mar-2013. The Lufthansa Group has about 22,700 non-stop seats return seats between Western Europe and Southeast Asia, giving it a 9% share of the market. European carriers combined have only a 30% share of capacity in the market. This also includes a 5% share from IAG subsidiary British Airways, a 4% share from its oneworld partner Finnair and a 1% share from Norwegian. Lufthansa serves Bangkok, Ho Chi Minh, Kuala Lumpur and Singapore. But Ho Chi Minh and Kuala Lumpur are both served via Bangkok, with three of the carrier’s seven weekly Bangkok frequencies continuing to Ho Chi Minh and four to Kuala Lumpur. The one-stop product to Vietnam and Malaysia puts Lufthansa at a competitive disadvantage as Vietnam Airlines and MAS serve Frankfurt with non-stop flights. Star alliance partners Thai Airways and SIA also both have significantly more capacity than Lufthansa on the Frankfurt-Bangkok and Frankfurt-Singapore routes. Lufthansa has cut non-stop capacity to Southeast Asia by 15% over the last year but sister carrier SWISS more than offset this reduction as its capacity has doubled year-over-year. The increase at SWISS was driven by the resumption of flights to Singapore in May-2013 with a daily non-stop A340 flight from Zurich. SWISS served Singapore until 2009 but as a tag via Bangkok. SWISS continues to serve Bangkok non-stop with a daily A340 flight and sister carrier Austrian Airlines also serves Bangkok, its only destination in Southeast Asia, with a daily 777 flight from Vienna. EVA Air, which is also now a Star alliance member, competes against Austrian in the Vienna-Bangkok market. 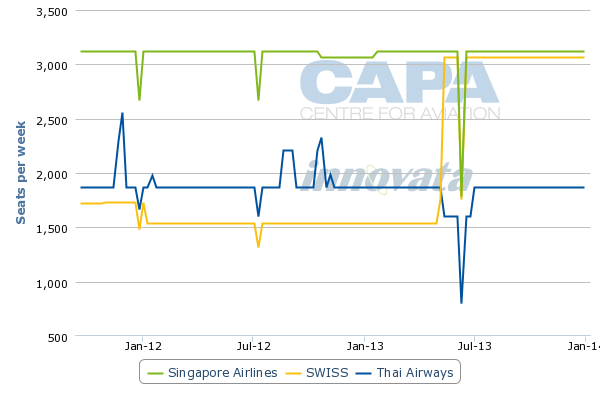 SWISS competes against Thai Airways on the Zurich-Bangkok route and against SIA on the Zurich-Singapore route. SWISS continues to codeshare on SIA’s daily service, which is operated with A380s, but SIA has not yet returned the favour on the new SWISS flight to Singapore. In recent years SWISS was reluctant to re-enter the Singapore market given SIA’s strong position on the Zurich-Singapore route. But SWISS corporations, which have a large presence in Singapore, persuaded SWISS to reconsider. Zurich-Singapore is a large premium market which SIA has been able to profit from by using its more premium-focused A380 configuration, which includes 86 business and 12 first class seats. SWISS is trying to target the business market by offering late night departures from both Singapore and Zurich. British Airways also has reduced capacity to Southeast Asia slightly over the last year. BA currently has about 6,100 one-way seats to Southeast Asia, a 7% reduction compared to Jul-2012. 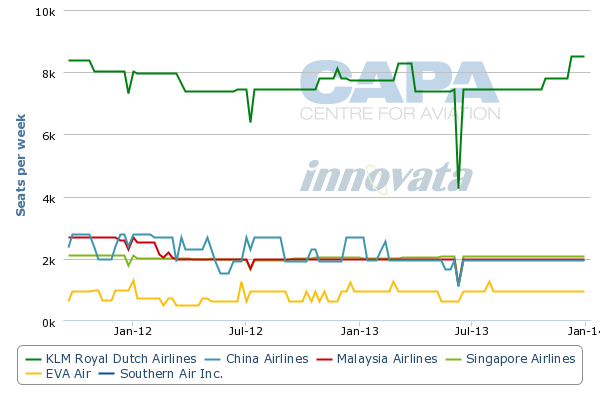 BA only has a 19% share of capacity between Southeast Asia and the UK, according to CAPA and Innovata data. SIA has significantly more capacity than BA on London-Singapore, which SIA serves with four daily flights and BA with two (one of which continues to Sydney, further limiting the amount of capacity BA has in the local market). BA’s only other Southeast Asian destination, Bangkok, is served with one daily flight. Thai operates two daily flights in the Bangkok-London market. BA does not yet serve Malaysia, Vietnam or Indonesia although MAS, Vietnam Airlines and soon Garuda Indonesia serve London. BA is now considering a London-Kuala Lumpur route, which is served by MAS with two daily A380 flights, following MAS joining the oneworld alliance in Feb-2013. Kuala Lumpur is also a potential destination for oneworld member Finnair. The Finnish carrier currently has about 4,700 weekly seats to Southeast Asia, which represents about a 28% increase in capacity compared to Jul-2012. Finnair currently operates one daily flight to Singapore and one daily flight to Bangkok. Finnair operates a second daily flight to Bangkok during the winter season. Finnair’s two Southeast Asian routes rely heavily on transit traffic, including to neighbouring Scandinavia (Finland is generally not considered part of Scandinavia). As it has a much bigger presence in the Thailand market than SAS, Finnair could potentially be impacted by Norwegian’s entrance. But for the time being Norwegian is unlikely to have a significant impact on competitors in view of its low level of capacity. Clearly Norwegian is cautiously testing the effect of lower fares (and generating very high load factors as a result), so capacity may well be increased if profits are being generated. Southeast Asia is a relatively important market for Finnair and KLM compared to some of their larger European competitors. Southeast Asia currently accounts for about 5% of international capacity for both Finnair and KLM, while it accounts for less than 2% of capacity at Air France, Lufthansa and BA. As a result Finnair and KLM would likely be the most impacted of the European carriers if Norwegian does expand its presence significantly in Southeast Asia. European carriers are generally under-represented in the sub-region, leaving Asian carriers and Gulf carriers to carry a majority of passengers between Western Europe and Southeast Asia. Norwegian could fill a void and Southeast Asia has the potential to emerge as an important region for its new long-haul division. But competition will be intense and it could be challenging for Norwegian to prove Europe-Southeast Asia flights can be viable under the long-haul low-cost model. In the meantime, it appears increasingly likely that European airlines will continue to explore alternatives that would allow them to tap into what is obviously a market they cannot afford to overlook, but where their current cost structures make expansion a perilous venture. The third part in this series of reports on the Southeast Asia-Western Europe market will look at the strong position of the Gulf carriers, which offer attractive one-stop products in the Southeast Asia-Western Europe market, as they continue to add capacity across Southeast Asia. The first part looked at the position in the Southeast Asia-Western European market of Southeast Asian carriers, including new entrants Philippine Airlines and Garuda Indonesia.